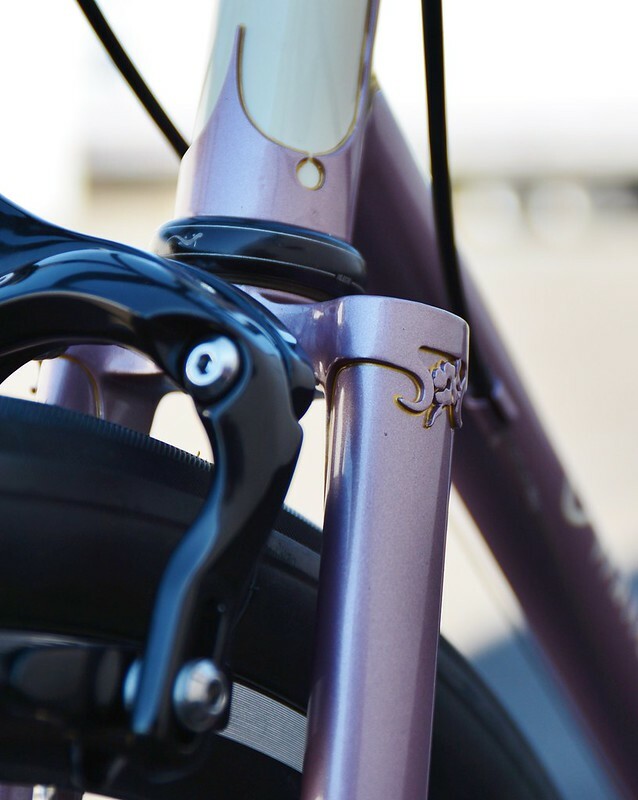 Another Parking Lot Preview (studio shots are in the can)- this time for the new "Hanabi" road bike. 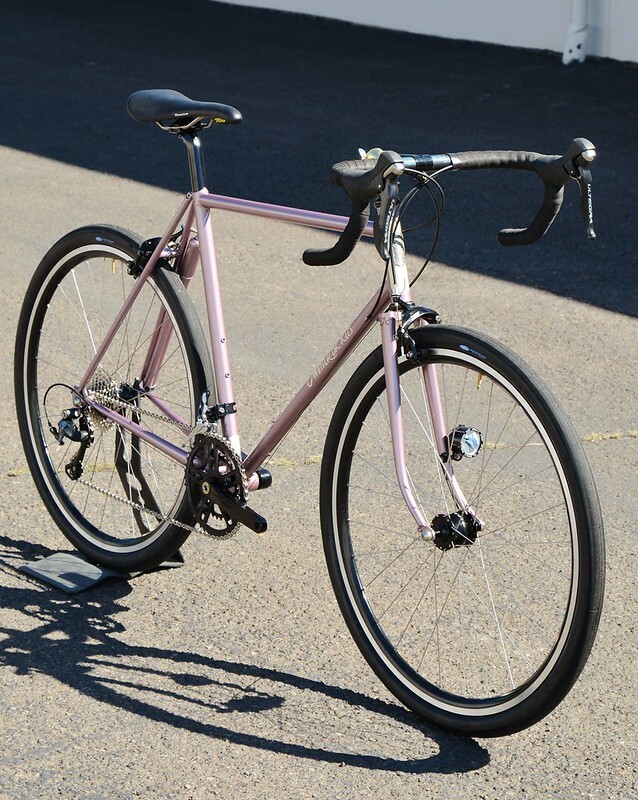 This bike is for a bay area rider who wanted some of the rough and tumble sturdiness of a wide 650b tire, but mated to the behavior of a road bike for paved and less-paved adventuring. This bike has room for fenders, but will spend most of it's time in this configuration. Built with a blend of my signature laminate and "Cute-Cut" style lugs, this is a great looker destined for some hard and heavy miles. If you are in Portland this weekend, look for this and some others at this years Oregon Handmade Bicycle show at Hopworks. Completely stunning work Eric! Just beautiful. I really like the color, is this wet paint? Thanks, folks. The liquid paint and lining are by Keith Anderson. 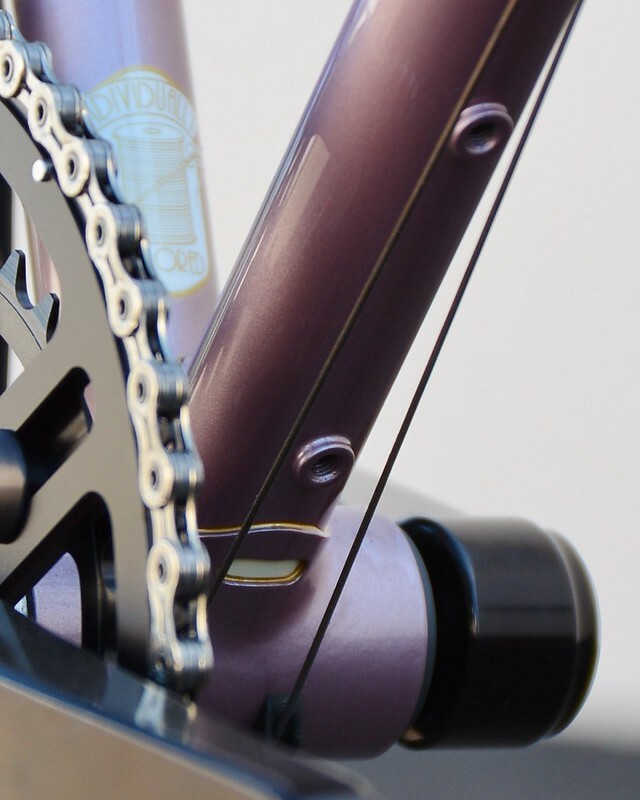 The powder strem and spacer (sized for a cable hanger should the rider switch to center pulls) is by Custom Powderworks. I'm sure I'll change my mind with the next creation you post, but this one is my new favorite. Nice job! 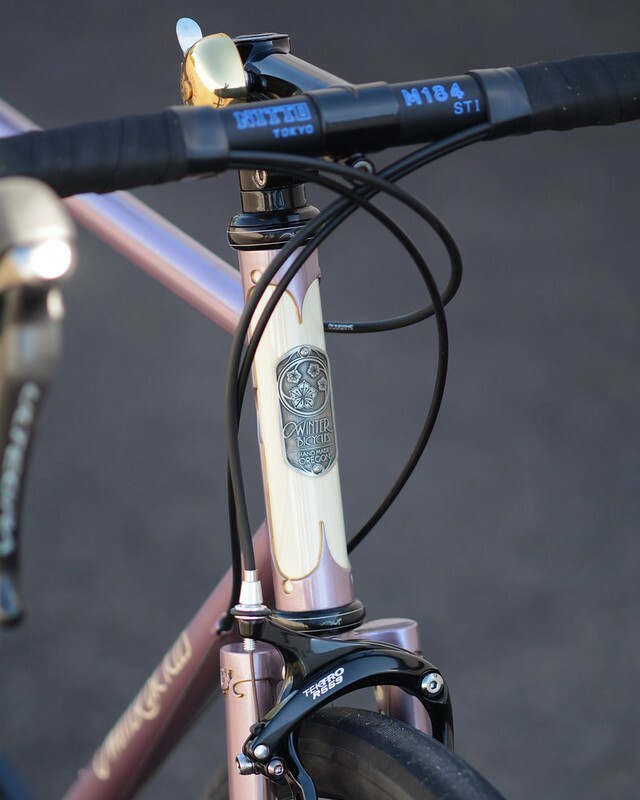 Gorgeous bike, really like the lined lug work and tasteful head tube badge. Really incredible. Paint and everything else. Love the mount for the edelux, wish all my road bikes had that and they would all have edelux on them. Hi Eric, this bike looks great. 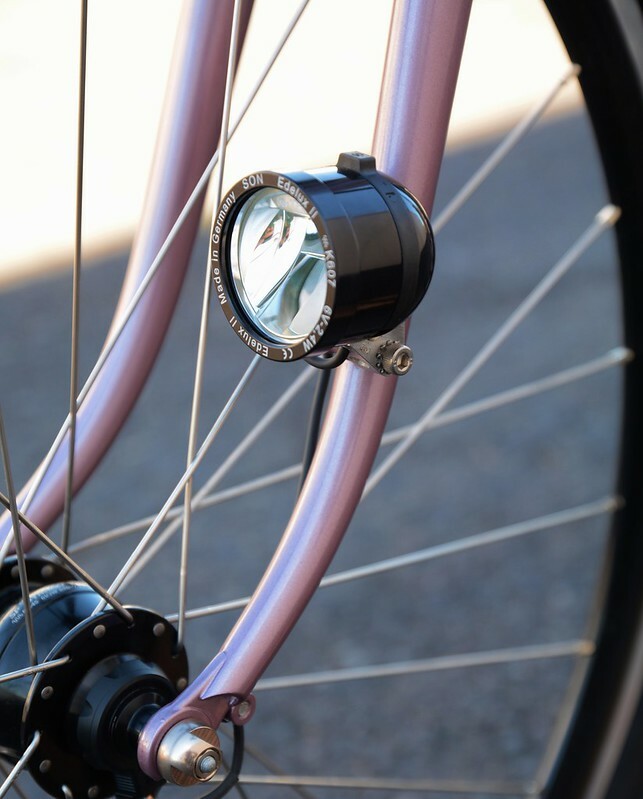 I have a question about with the light positioned on the mid fork blade, whether the light casts a shadow from the tire forward and above the light. Thanks. It does, but with it properly positioned and aimed it's minimal.This was a specific client request and we worked through the options in advance. really cleans up the bars and crown area. having a higher output lamp really makes it. those lugs. just the right amount of detail. the paint reminds me of the light purple of the old austro daimler ultima but way nicer. THAT is a seriously gorgeous bike What tires are those if I may ask? the tires are compass something or other. Do those tektros work well? I haven't had spectacular luck with mine. Those are the new Babyshoe Pass (the light ones) under Tektro R559. Other than the shake down ride I don't have direct riding experience with either, but the owner of the bike enjoys both and has good things to say. He's ridden a bunch of other stuff and I take his word for it. I've had good luck with both the Compass products and the better Tektro/ TRP products. 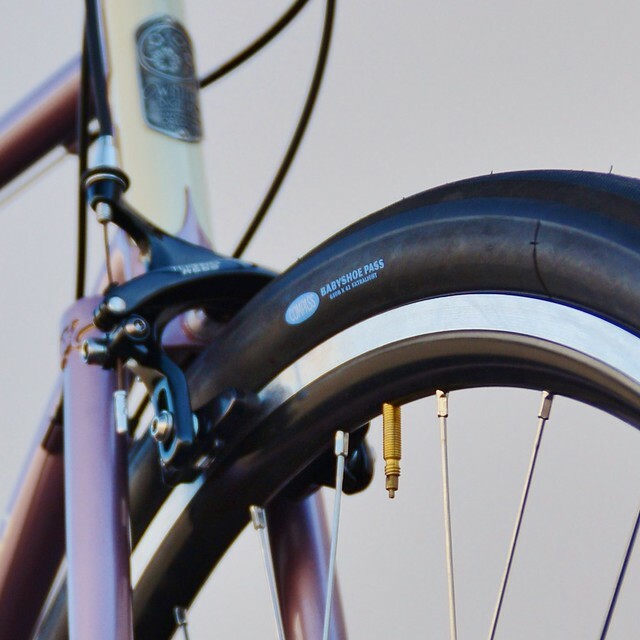 This bike was designed specifically to be a fat tire road bike (not a "racy rando"). 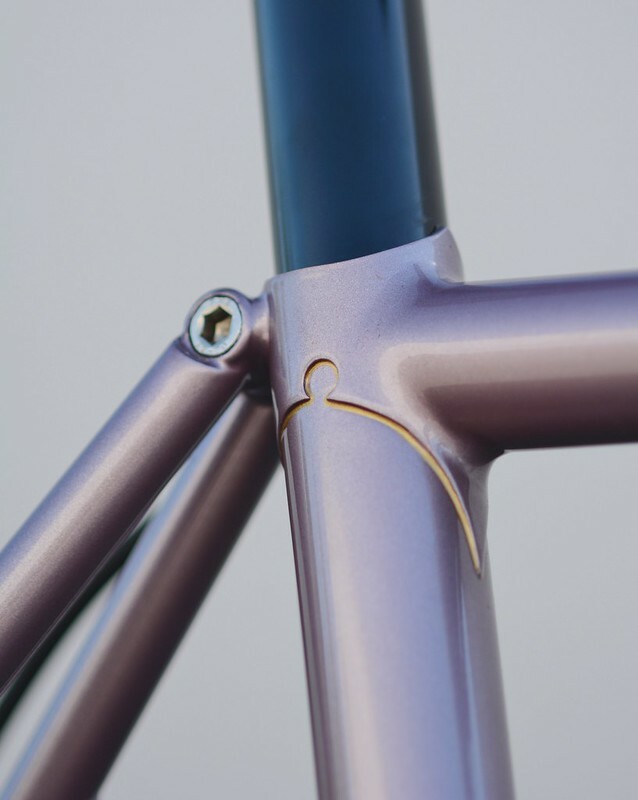 The choice for a longer reach brake over centerpulls or the like was, in part, to keep that look and feel.